I have written an entry about Circus Ponies Notebook (CPN), a program I can only highly recommend for collecting and structuring information for writing projects. You might want to read that entry first. In this entry, I’m going to give a short overview of how Circus Ponies Notebook can be used for academic writing (e.g., writing of a diploma or PhD thesis or an scientific article). What do you need to write a scientific text? Besides skill and training, you need to have the information available (with their sources) in the right order. A possible workflow (about 2009, changed over time). Essentially, you use Circus Ponies Notebook and its outline pages to collect material, create the structure, make sure the logic of the argument is correct, collect results, etc. You build a huge bone skeleton of all the necessary information you have to have available for writing. If you have collected everything and found an order that works, you write down the text with a text editor (I strongly recommend using Scrivener), i.e., you create the meat and skin of the text. I write down any information I want to remember on a page created for that source in my Bibliography.nb (Circus Ponies file). 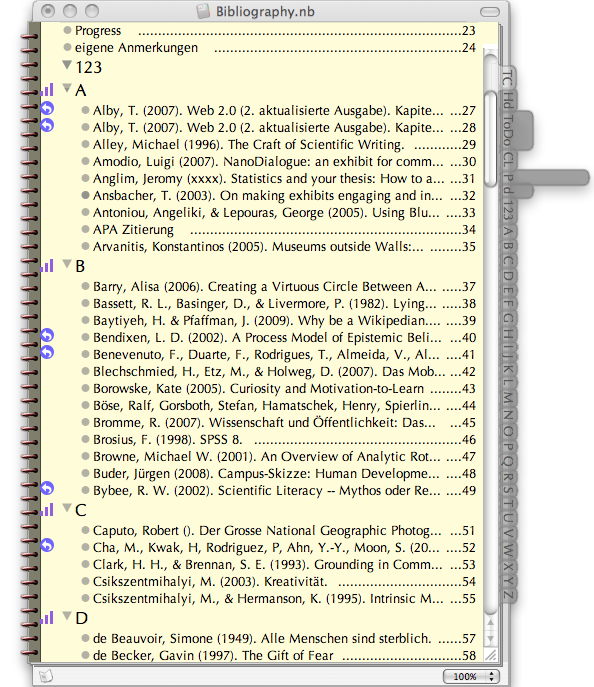 The Bibliography.nb is a typical CPN file. I have made dividers for each letter of the alphabet (and one for numbers). The dividers automatically have a tab on the side of the page which makes navigation easy. I use the surname of the first author to sort the page into the bibliography. The dividers themselves use auto-sort, so I just have to select an entry somewhere in the C-divider, press enter, type in the name of the author starting with C (in this case), and after I finished typing it automatically appears at the right place. Having one outline page for each literature text you read is really helpful. The style changed over time. Find something that works for you. The page is titled with the source of the article as I would have to cite it (e.g., Wessel, D. (2007). The Role of Mobile Devices to Satisfy Situational Interest in Informal Settings In M. E. Auer, & A. Al-Zoubi (Eds. ), 2nd International Conference on Interactive Mobile and Computer-Aided Learning Kassel: Kassel University Press.). I usually copy-paste the citation in the first cell of the page and copy the .pdf of the source below it as a link. The files are all collected in a folder called cp-bib-files. It is easy to backup a CPN file with only text than backing up a file that contains over a hundred .pdf-files. The .pdf file can be opened by double clicking on its image, which is very convenient if I want to re-read something in detail or send the file to someone (as Preview can Mail Documents). As further structure I usually follow the structure of the original text, but I include higher-level summaries in the outline (e.g., a small summary on top of the page and at the beginning of the notes of each chapter or section). If an image or a figure is important, I usually copy-paste it from the .pdf directly onto the CPN page. I do not link the images because they are necessary to understand the notes. If I loose the source file I can find it again. If I loose the image, I do not know what the text refers to. You can simply drag the PDF into CPN. However, I have since put all the PDFs into a separate database. Looking back I would be careful with linking files — if you do not copy them into the CPN file you must make very sure that you keep the folder with the files intact. If you copy them, the file soon gets unwieldy. One reason why the literature is now in a separate database. You can easily make hierarchical outlines and fold in the parts you do not need at the moment. A killer feature: Tagging the cells with the source information. If you copy it the right way (CPN has different copy & pastes) the source information sticks to the cells if you cope the information into other notebooks. Great to construct a writing outline. That’s it. Every cell should now be tagged with its source. You can use cmd + k to display the keywords. As long as you remain within the CPN files and use only copy+paste to transfer them from one CPN file to the other, the keywords remain attached to the cells (they are not transfered if you copy only part of the text of a cell or copy-past-as-outline/plain-text cells!). If I am learning about a new topic I usually create a separate page where I link to each article that refers to this topic and make some notes about the content of the article. It helps me to get a short overview about the articles I have read. Imagine you want to write a handbook for yourself with all the statistical methods you need in your work. You have read articles about, e.g., explorative factor analysis. If you want to use the content of one of those articles in the handbook, you can simply copy-paste the cells in the new structure in the handbook.nb file. The source information remains attached to the cells, as long as you copy complete cells and not the textual information in it, and you do it with simple copy-paste and do not use “paste as outline” or “paste as plain text”. This allows you to collect information about exploratory factor analysis from different sources on one page in a new CPN file. After using the information on a page I usually write “copied: xxxxx” with xxxxx denoting the name of the document I used the information for. It prevents me from using the same information twice and helps me to keep an overview which information I used for what (and what to reference to when I write a related article ;-)). When the newly created outline (e.g. handbook.nb) is finished and you have all the information from different sources you need in the order that makes sense, you can start writing a text with it. And that is the beauty of this solution: When you have your information digitally like this (and this includes the .pdf-files of the articles, books, etc.) you do not need more than your notebook and the CPN file (here: handbook.nb). You got the information, you got the source you have to name, that’s it. Now you can concentrate on writing the text without having to lookup information after information. Like all good infrastructure modifications, it places a high load on creating this structure and really reading articles this way, making the notes digitally and tagging them with the source as keyword. But once you have this, it all becomes very simple. And you need it simple, because writing takes a lot of cognitive capacity: finding the right sentence, or even the right word, take a lot of effort, and this solution can reduce that effort (or extraneous cognitive load) considerably. I have collected a lot of information about mobile media in museum for my dissertation thesis. The articles I read came into the Bibliography.nb file, from which they were copy-pasted into my DissOutline.nb. I retained the source information but could order the cells as I saw fit, e.g., what do I need in the theoretical background, what in the discussion, etc. Part of my dissertation outline. Writing was very, very comfortable. This file became the starting point for an article I had to write, but I wanted to use only part of the information of my dissertation outline (the main problem is that you can collect a lot of information, so that you have to choose what to use and what to discard, but I like this problem better than the opposite: not knowing what to write). So I created a new file and copy-pasted the information I wanted to use in the article1.nb. After resorting the information so that a thread became visible that the article could follow, I opened a text processor, put the article1.nb outline next to it on my screen and started typing. Because all the necessary information was in the outline of article1.nb (including the results, tables and graphics from SPSS, etc. ), I did not need to refer to any other sources of information. The following image shows my desktop while writing the first article (BTW, it got rejected by the first journal we tried to enter it, but that’s unfortunately part of the game). I used Pages as word processor because the article was very straight-forward and short. A huge advantage of an outliner. You can put the outliner next to your writing software — it does not take as much space as a mind map or the like and you can still see the source information (cell tags/keywords) you need to cite. The next image shows the same for article 2. I began using Scrivener beginning with the second article. It is just the perfect application for scientific writing, especially for longer texts where you appreciate the Backup-function and quick navigation. I wouldn’t directly start with Scrivener, since it is for writing, not for organizing (it has a research area but that is nothing compared to the power of Circus Ponies Notebook). But for writing it is — for me — the undefeated champion. A better writing program. 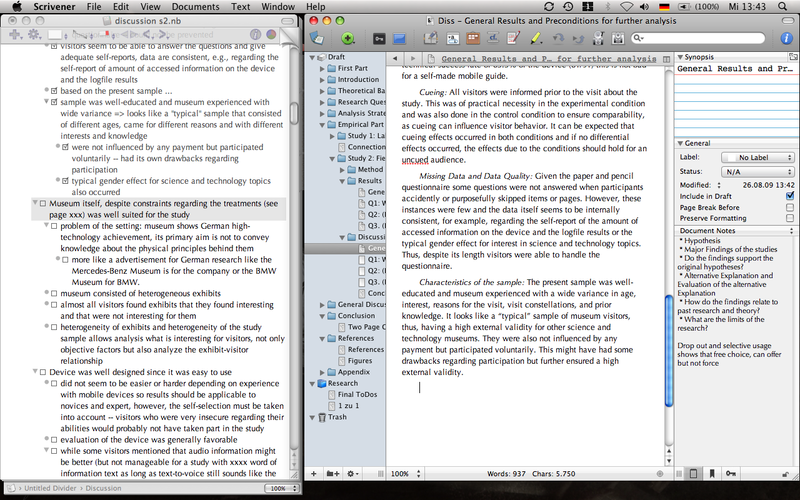 CPN works beautifully with Scrivener (actually you just open both and place them next to each other). But still, a dream team. The last image shows yet another outline I used for the discussion section in my PhD thesis. Given that it is very easy to copy-paste the information, you can create a new CPN file and then focus on specific bits, e.g., the discussion. In that new CPN file you can play with the information and order it in a way it make sense. Even on a small Notebook screen (wrote it with a 13″ MacBook) you have enough space to work with. It strongly reduces extraneous load and let’s you focus on writing. I am incredibly impressed with your system. I’m a graduate student (political science) and an avid user of CPN, but I’ve never seen it used this way. Would you ever consider sharing your template(s) for this? Thank you for the nice comment. There is no real need for a template. It’s just creating a notebook (blank or Apple+N), going to the contents page and creating 26 Divider Pages (A, B, C, …). Then you select the cell with the first letter (not the content), right-click, select “Sort Children” => “Auto Sort”, then you click on the three vertical bars icon that appears next to the cell and select “Alphabetize”. You repeat this for every cell with a letter on the contents page and that’s pretty much it. The strength of the system lies in CPN itself, you just create a Notebook and use it this way. Thanks for the reply! What exactly are your settings for attachments? I can’t seem to replicate how you have it on your page. 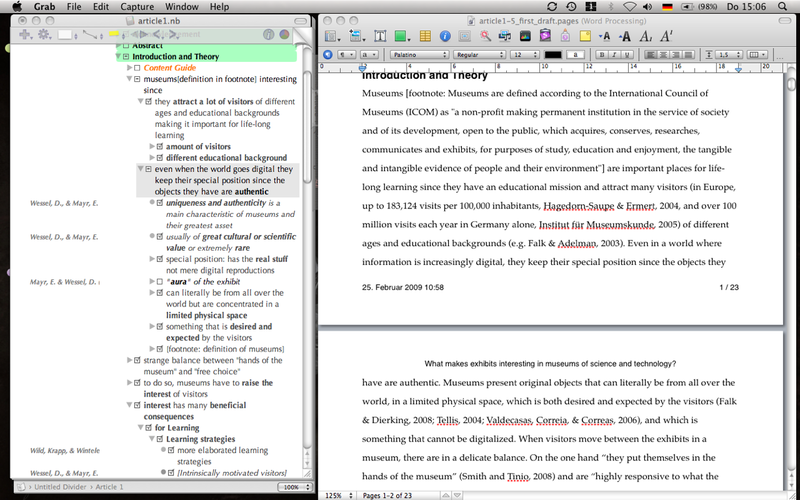 I either get a text link, or an actual import of the pdf into notebook (which would make for a pretty big notebook). I have set the settings (NoteBook – Preferences) so that the “Default drag-and-drop action” is “Link to the original file” and “When adding a document” it’s “show the document’s contents, otherwise show its file icon” with “scale the image to fit” and “anti-alias the image”. Should work this way. You can also press “alt” while dragging a file onto the CPN page to change the default behavior of copying (green plus) vs. linking (curved arrow). It’s too bad that you cannot link directly to your bibliography page by clicking the keyword. For example, by clicking the keyword “Rounds J. (2004)” in your article.nb, it would open that page in your bibliography. That would be useful if you needed to refer to something in the article pdf that you didn’t capture in your notes. Hmm … I haven’t seen cross-Notebook-links so far, but it would sure be nice if they would support it (if it isn’t already). On the other hand, having the reference (Name, Year) and the Bibliography open works well for me (and having the keywords appear on the Multindex page is also very helpful). Usually, if I have copied the relevant cells into my-article-notebook, I’m finished with the article I’m referring to, so I do not have to refer to it so often later. If I have to refer to articles often, I set sticky flags (you can also set one on the Contents page to quickly access it). Regarding referring to the article itself, I’m becoming a huge fan of Adobe Acrobat (not the reader but the full app), given that it supports OCR (Document – OCR Text Recognition – Recognize Text Using OCR …) which is really nice if you have scanned an article and you want to find the page number where a direct quotation is written (I once searched a direct quotation from a few-hundred pages book that I had scanned, didn’t know the page number, OCR Text Recognition, got a cup of tea, came back, entered part of the quotation, bingo ;-)). There are other OCR programs out there, some perhaps better, but this built in function is pretty nice. If only all professors would scan with OCR! That’s would be wonderful. 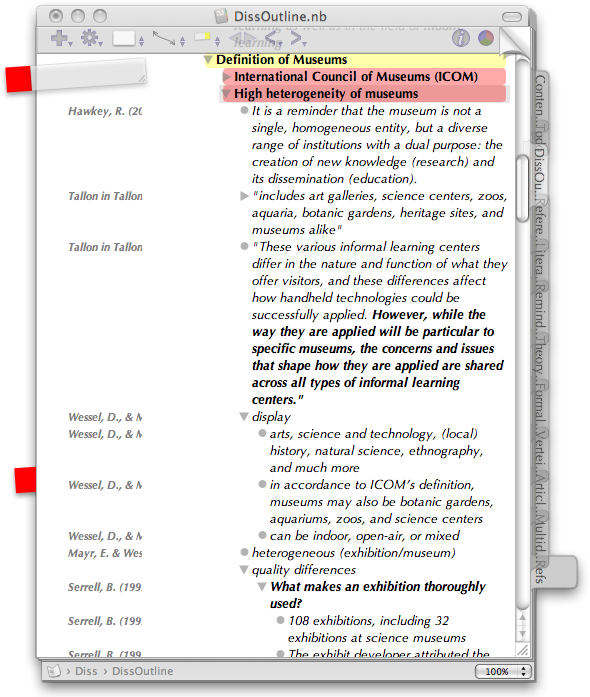 If you’re interested in PDF readers, I strongly recommend you checkout Skim (http://www.macupdate.com/info.php/id/24590/skim). I really like preview, but I’m afraid Skim far surpasses it. 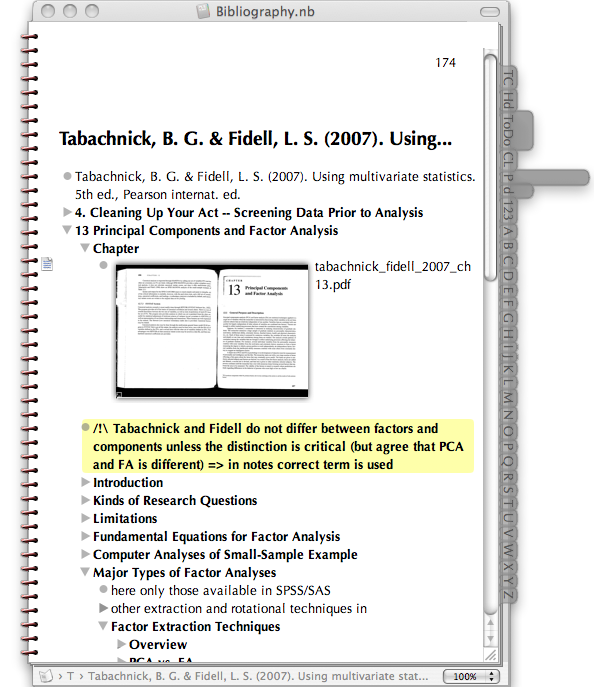 PDFpenPro (http://www.macupdate.com/info.php/id/16857/pdfpenpro) is also another fantastic application, very professional – scans with OCR. Thanks a lot for all of your replies – I have found it extremely helpful and I look forward to using this system this semester. I’ve been trying to approximate the format of your notebook. What setting do you use to get rid of the images of the wholes or of the binding on the left-hand side of your notebook? you can change the appearance of the notebook with the Notebook Inspector (press Shift + Cmd + i or click on the Inspector Icon to get the inspector, then choose the Icon near the top of the Inspector Window that looks like the cover of a notebook — the title of the Inspector should be “Notebook Inspector”). You can change the appearance with Backing and Binding — I think I use Aqua and Pad (via the dropdown menu, it’s probably on Spiral per default). You can also change the default options for new Notebooks in the Preferences (Cmd + , or click on the menu bar on the top on NoteBook and then on preferences). CPN has a lot of options, it’s worth either reading more on the official website about it or playing around with them, depending on your learning style. Thanks for the answer. I have another question if you don’t mind. Under the subheading, Separate Overview pages, you describe tagging each quote. I’m not sure I understand why you do this. Do the keywords link back to the original source? no, unfortunately not automatically. I copy the name of the article on the overview page (it is written in the first cell of the page anyway, so it’s just copy and paste), highlight the Text itself (in the cell) and then use Circus Ponies Notebooks Link Function (Edit => Link => To Another Cell or Page; then go to the page (mark a cell if you want to link it to the cell) and select Edit => Link => Complete Link to [Cell|Page]). BTW, I’ve switched to DokuWiki for dealing with literature, also I cannot recommend it at the moment for this kind of work because I’m still testing it. The first trials however seem to be promising. On the other hand, I miss the comfort of Circus Ponies Notebook, especially the Outlines and the use of keywords to save the source to each cell. And for planning an article or any major work, I will still use Circus Ponies Notebook — without its outline feature I would not know where to start. Hi! I just stumbled upon your website while searching infos on how to use Scrivener to write my graduation thesis. While I was trying to understand your workflow for writing a thesis, I was wandering what are the purposes of the other tabs in the DissOutline.nb file, since you wrote the outline of the paper and all the notes in just one divider (DissOu…). So what are the purposes of the other dividers like Refere… Litera… Remind…. etc? – ToDo — the checkboxes are really helpful here. Multidex — CPN’s automatic Multidex, where the keywords page (= References) has it’s own tab (Refs). I have read & re-read your wonderful page here & while I am trying to learn to love CPN (i tried it once a few years back because I loved the notebook metaphor), for me it is a bit unnatural & that is highlighted as I am struggling to follow some of your ideas/methodology here. Can I please clarify – you don’t (didn’t) use EndNote or Mendeley, Papers etc .. as ref managers but made your own dedicated NB file? Where did you file all of the original docs? Just in a file & then relied on CP to bring up the PDF when required? – do you see DTP as a partner-in-crime for this workflow? I am hopeful that I can get a similar workflow up and running while at the beginning stages of writing – I am re-entering & it was huge stress for me previously when information started getting out of control – I had PDF’s & links saved in a few different programs as I couldn’t decide which one to use because I couldn’t get a decent workflow going with ANY of them. This article makes me hopeful that perhaps I can do all of my writing/note-taking digitally, I am an analogue reader – it makes more sense to me to write on paper/make notes by hand but obviously this is wasting time so I need to commit. actually, it doesn’t matter (much) whether you put the files into the .nb file or just link them to the page that deals with the article. The only thing I would really make sure is that you have a clear and always followed convention for naming your literature files. For me it was authorname_year (or authorname_authorname_year if it were two, etc. up to six names, for example: schmidt_richter_2009.pdf). But it must be a clear convention. I had the files in a folder structure, as the amount of files increased I made subfolders for the first letter of the first name. You can either use this folder and drag the PDF onto a notebook page or you can copy it into Circus Ponies Notebook. I think the huge advantage of this solution was that I had one page for each article in CPN in an outliner page format where I could write down the important aspects and tag each cell of the outline (assign keyword) with the convention for the literature files (e.g., “schmidt_richter_2009”). This made it possible for me to later copy the cell into my dissertation outline without loosing track of the source (what was my idea, what did I get from which article). To get into a topic, learn to read the literature and to make a single product (the thesis) it worked like a charm. However, you still need to set priorities what you read and which information you write (or copy) into the outline to that article. And yes, I did not use a dedicated literature management program (tried out a few, though). Thing is, I found it too limited for my taste. 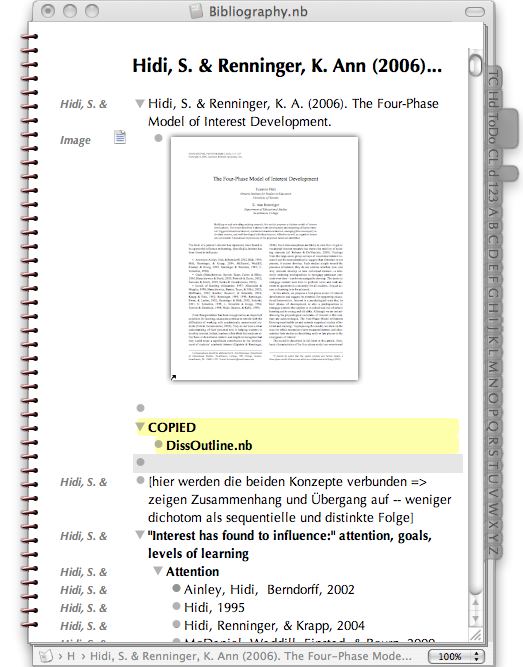 While it is nice to have the source automatically in the references, I simply write the correct citation in the text when I write it (“… Schmidt and Richter, 2009, however …”) and later check the whole text, copy the citations I have used at the end of the file and copy & paste the citation information (has it’s own cell) from CPN to the document. I once made a mistake of not checking the references manually and the paper got rejected ASAP because there was a mistake. Since them I do it manually, but this is a matter of personal preference. CPN is not made for literature/reference management and cannot automatically give you the correct citation format, however, it can deal with your notes regarding the source much better, something where most reference managers are really, really bad. Unfortunately, CPN got too large and too slow for my tastes (although according to the customer service I talked to recently, this should no longer be a problem) and my topic expanded to different subjects, not a single one like during my PhD. Thus, I switched first to a Wiki (cannot really recommend it anymore) and now to DEVONthink. I still use CPN to create the detailed outlines with all the information I need to write an article, a proposal, or a conference abstract (or a complex blog posting ;-)). I think this academic workflow works and I hope that I can do something similar with DEVONthink. Given that the works I produce are no longer this large (the thesis was quite complex) and that I copy only the main thoughts now, it should work, I hope. For your current work I would suggest using CPN — if (and this is a big if) you can work this way. You would have to go three steps — first: get all your sources into one place and write down the information you want to use in the cells of the outliner of the respective page (tagged with the source which can be done within a few seconds by using select all), second: create a new CPN with an outline page where you make the structure of your thesis and copy the information units from your literature CPN to (use copy&paste and make sure that they keywords remain attached to the cells — you need the source information), and finally: after making sure that you have all the information in the right structure in the outline, use a good writing program (I recommend Scrivener) and write the text according to your outline. 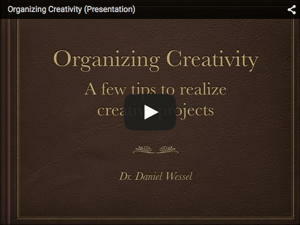 You do not need inspiration or “flow” for this, it’s a craft and you have all the information you need in the outline. But I don’t think that there is one “best” solution — you have to be able to work without frustration with the program and you might like to work with paper outlines, drafts, etc. You have to find a way that works for you. I tried out multiple things until I found something that does work (sufficiently) well for me, and I still monitor my behavior and change processes that take too long. Ah, and I forgot DTP, yes, I used InDesign after I was satisfied with the text to set my dissertation thesis. No need to work on formatting until the text is finished. I love InDesign for this task and it performed admirably. But only after all the text was finished. I have and am very familiar with CPN. Great to see how you have put it to use as I prepare to start my thesis. But before I start using it as my repository, I am having reservations. I am wondering if you ever considered Boswell or Zettelkasten for literature management? I seem to keep picturing some type of quotes management system, yes for the thesis, but for more than that. I only discovered Boswell yesterday, and it probably comes closest to what I’m seeing, yet I have reservations. I would like/envision a quote/thought gathering spot that contains everything I find significant – each quote as a separate entry, so they can be found and connected in varying ways. I had thought of using DEVONthink that way, but cannot seem to figure out how to make it work. My concern with CPN is flexibility, its ability to be the repository over the long haul, and it’s ability to search for multiple connections over time. At this point, I am starting to feel a bit like (the other) Deb. I have some stuff in a variety of placed, and my brain is feeling disorganized. I need to bring it all together, for the thesis, but beyond as well. p.s. I am very visual – I like to see things in front of me – it’s like if I can’t see it, it’s not there (middle aged brain!!). Also, too much clutter distracts and overwhelms me, confuses the brain waves. As I am not exactly ‘computer literate,’ simpler is better. Along these lines I have found Twig, Tinderbox’s baby brother, most helpful for thinking and planning out projects – probably a step before your CPN outline – the big picture of where I want to go and how I’ll get there. I absolutely love Twig, but go to Tinderbox and start talking agents and my brain chuts down. Also, I have found Ulysses a better fit than Scrivener. first thank you for the links — I didn’t know either Boswell nor Zettelkasten. I’ll have to get back to both program later, but both seem interesting, albeit a little dated (Boswell is “Tiger compatible”?) and like a one-person company (Zettelkasten). I have heard about Ulysses and I’m curious — why do you like it more? What is the purpose here — to manage quotes in the sense of interview quotes for qualitative analysis (have you had a look at AtlasTi?) or to collect notes about anything? What did you try to do with DEVONthink — what do you want to achieve and what happened instead? I agree that CPN is — as great as it is for making a structured collection — not that good for a collection that has a very flat hierarchy and many crosslinks. For this, DEVONthink or even a Wiki might be better suited. Hmm, perhaps another aspect is to differentiate between long term storage of useful information and a current, time-limited project like a thesis. I am a strong proponent of keeping everything work related in one place, but I would create a new file (CPN) for a specific project. This way I can easily make the information in the repository available for the project (e.g., tagging relevant articles with a keyword for the project and having them listed in a smart group that searches for this keyword) yet still have the flexibility to use another system to create the actual product (first CPN, then Scrivener to write it, then Word to make a submission version out of it). Currently DEVONthink works well as the heart and main repository of all the information I have. One word regarding the thought gathering — I found it invaluable to use a collection inbox. Whether it’s a file you quickly open with Quicksilver or Spotlight, or, for Windows users put a text file in the task bar, this file helps you to gather your thoughts on the spot without deciding first where to put it into the collection (which has the risk of forgetting the idea). I still use a text file for this and using Quicksilver to open it in the blink of an eye, because DEVONthink’s Dashboard Widget immediately creates a file out of it. In many cases the first thought is followed by others seconds or minutes later and I would hate to have them all scattered in different files. Given that I use it en passant and type very fast with 10 fingers, it doesn’t really require effort and it is incredible what accumulates in that file and you end up with a lot of information to reflect. I will look forward to your thoughts on Boswell and Zettelkasten, particularly the latter. I couldn’t figure it all out on my own, and I don’t know German. I don’t consider open source, free, an older program, or one man shop a problem if the software looks solid and developed – if someone is there behind it. Given some history, some stability, the date or one man team don’t matter to me. In this case, each program seems to do similar things (I think….again, I’m note sure about Z. ), with one being free and one being $100. If I can get the same thing for free, that’s good. If not, I’ll invest the $$. My preference for Ulysses is its simplicity. I found myself really wanting to like Scrivener because it seems the whole world does, but it kept overwhelming me. There is a lot there to like, but it was more than I needed, particularly as I do my organizing/planning in other places. I should have said citations instead of quotes. It is all the gems from all the books, pdfs, journals, web stimulated thoughts (I am seriously thinking of buying a scanner and cutting up all my books, thanks to you!). It’s my papers, class notes, prof’s papers…all the resources, all the stuff. That pool/resource of information would contain the bones of the thesis (which I would search and copy into a CPN nb), but I envision one permanent repository for all of it – information management. That vision seems to be like a 3×5 card file, with one quote/idea (and its source info) on each card. Some cards have an essay attached, a pdf….but the picture is a thought per card – organized, yet searchable by different criteria for different needs. I don’t know how to use DT for those kind of ‘bits.’ Do I make each source (book, pdf, etc) a group, then each 3×5 entry a file within it…somehow tagged with the source, or group, so I can trace back and find the source info? Must be possible – just not sure how. In CPN, the various quotes/notes from each source are gathered on one page – hard to search and pull out different bits for different needs. Perhaps my vision of each quote/bit needing to be independent and separate is incorrect. Perhaps the programs can deal with them connected – can separate them out when necessary, and I just don’t understand how that works (as I said, I’m not particularly computer literate). I probably am envisioning something non-hierarchical. Just throw in all the bits, and have a Harry Potter wand magically swirl the papers about and gather out all the relevant pieces when I ask. Thank you for making me think about the collection box. I have bits scattered in too many places, and bits I have lost because I didn’t get them down in time – too early in the morning – wrote that section of the paper in my mind while I was driving. I have decided to re-look at DT, get more comfortable with it, and use the DT drawer notes (drawer sits on my desktop) for instant idea collection. I do hope to hear back from you about Boswell and Zettel…. Thanks again for how you have helped me. p.s. Where did you store the pdfs of your 100+ books? In DT? I understand the argument that software should be appreciated for its actual value and not the team behind it and that that there is no need to buy expensive software if you get the same functionality for free. However, especially with planing to store information for longer time frames, I would make sure that the software is supported in the future. At the very least I would make sure that I can remove the data from the software *easily*, that it is not a data island. Image that you have all your data in a software that stopped development with Tiger. It still runs on Leopard and Snow Leopard, now we have Lion. In a few years we have [cat x] and during this time your computer fails. You need a new one, which runs only the new OS, to which your software is not compatiable. What now? If worst comes to worst, you might have trouble finding a computer where you can reinstall your software and extract the data. I wouldn’t mind a small company product for short tasks (this isn’t a problem that applies to Scrivener), but for longer time frames and something where I invest a lot of effort, yes. This doesn’t mean that CPN, DEVONthink, etc. will survive in the future, I just think it’s more likely. Reading about the citations and the index cards, it looks like something for DEVONthink — in case you really want to put a single citation on a single “card”. Why do the citations have to be independent of each other? What would prevent a page for a source like with the CPN workflow? At least for the project itself? Do you want to name the index cards like “authorname_year” or do you want to refer to the content? Or just an id like 1, 2, 3, …? Image that you have your sources sorted this way, how do you work with it? Play the whole process in your mind (or even better, sketch it on paper). How many steps are necessary each time you include a source? Are there too many steps to do it quickly — e.g., consistently? Can you easily find the information when you need it? DEVONthink would allow you to use tags like “thesis_introduction”, “thesis_theory” to make sure you quickly find the relevant material in smart groups, but you would have to use an outliner (I recommend CPN) to get the information in the right order (it involves a lot of copy & paste, but you slowly and steadly build an outline for writing). I think DEVONthink would work to collect the information, and I would use tags like “in_thesis_cpn” to make sure that I do not copy the information I have already copied again. The smart group “for theory” would for example look for files where all of the criteria “thesis_theory” and NOT “in_thesis_cpn” are fulfilled. Another smart group would look for files that are not tagged with “in_thesis_cpn” to find the ones I still need to copy. It might work, but you have to try it out whether the workflow works and is sustainable for you. Regarding the PDFs and the structure — I would use a consistent naming scheme (author_year.pdf), put all the PDFs in a group with an A-Z index (copied into DEVONthink, a separate group and index for videos, for images, etc. ), and in the concrete text or rtf file containing the citation only include a reference to the file immediately after the citation (as [author_year]). You need the source (otherwise you slither into plagiarization) and you do not have the advantage of keywords connected to an outliner cell as you have when you collect your literature with CPN. So for the first citiation of a source I would create a new text file, write the source information into it, then copy it (left click, drag until you see the plus, release), and copy the citiation into this file, for the next one copy the original file again, repeat (saves typing the source each and every time). That is if you want to cut down one source to multiple files. For finding the citations I’d use tags (create a tag list and rely on autocompletion) and rely on the search function. I’d be interested to hear whether it works for you, or, if not, what made the system unsustainable. I just noticed that I probably misread DTP … for me DTP means Desktop Publishing, not DEVONthink Pro, so I thought it meant the program I used to create the finished version of the diss (for which I used InDesign, a DTP program). Looks like the discussion continues on the Sente — Reference Manager for Mac and iPad Posting. Hi Daniel! Thanks a lot for your great article, really helpful! One question: Currently I’m in the process of writing my thesis and I have two notebooks, one is for my references and the other is for the thesis content outline. I’d like to copy one cell (parent cell, but has lots of child cells) from the references notebook to my thesis notebook (and keep the citation ref -which is the keyword); however, I only want to copy the parent cell, not the whole child under it. Is there anyway to do this? since each time I paste the parent cell, the child cells come with it and I need to delete the child cells which is a boring, waste of time and irritating process for me. Any suggestions? hmm, good question, no idea. I would ask the people at CPN, they are very interested in feedback and might be able to help you (even if they only include it in future versions). Is moving the child cells to the level of the parent cell in the original notebook, copying the parent cell, and then pressing cmd+z to undo the indent any help? You risk accidentally changing your original notebook, but you can do this probably more quickly. The content in the clipboard (“ex-parent” cell) is not changed by the undo. If you save the source notebook before carrying out the procedure suggested by Daniel you do not run any risks, because you can simply revert to the saved notebook (‘revert to saved’ in the file menu) if, by accident, cmd-z doesn’t work. Instead of copying the entry after unindenting the children you can also option-drag it (this will copy the entry) and press cmd-z to undo the unindent or even drag it (this will move the entry to the target) and press ctrl-z twice (after the first press the entry reappears in the source, after the second press the former children are unindented). If you find this boring use a macro utility such as keyboard maestro to combine the steps! By the way, the keyboard shortcut for demote (unindent children) in NoteBook is option-tab. I have occasionally used the procedure suggested by Daniel and never had problems, It is indeed much faster that copying the parent cell together with the children, especially if the children have attachments for in that case you not only have to delete the children but also the discarded attachments that result from deleting the children. Important: ‘press ctrl-z twice’ in post #28 should be ‘press cmd-z twice! Sorry. It is late and I probably shouldn’t respond at blogs at this time of the day. Sleep well! Your workflow as you describe it is now 2 years old. Can I clarify – has it changed (e.g. 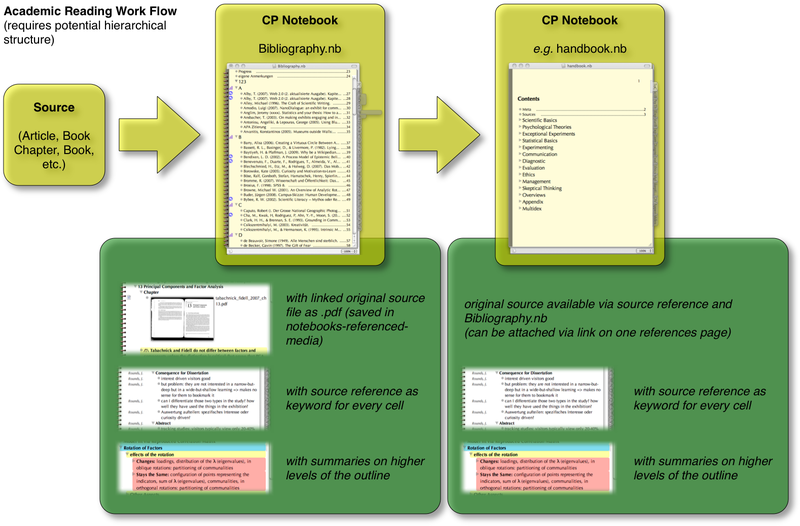 with new version of CPN – do you still use it to outline documents? 1) Do you still recommend or even use CPN? 3) Is Scrivener your finishing off software – i.e. for final writing only rather than planning phases…? Just a little confused by the workflow – and by what you think of the players today in 2012? Also – omnioutliner in terms of columns etc – seems very useful – can CPN emulate this? good questions, actually I have changed a little, but I still use CPN for content outlines (see recent posting) and yes, Scrivener is — in my opinion and for my purposes — still the best writing software. Regarding DTP, I do not use the links, I use DTP mostly for sources. I like the flexibility that no reference manager program offers (e.g., it does not matter whether it is an image or a PDF, DTP can handle both the same). 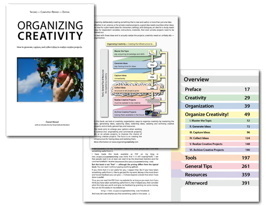 I will update my workflow sometime in the future (i.e., hopefully this year), until then I would recommend the General Tips section of Organizing Creativity. Thank you for this excellent blog! What type database do you use to store the pdf files you have linked to your Notebook? thank you for the positive comment. 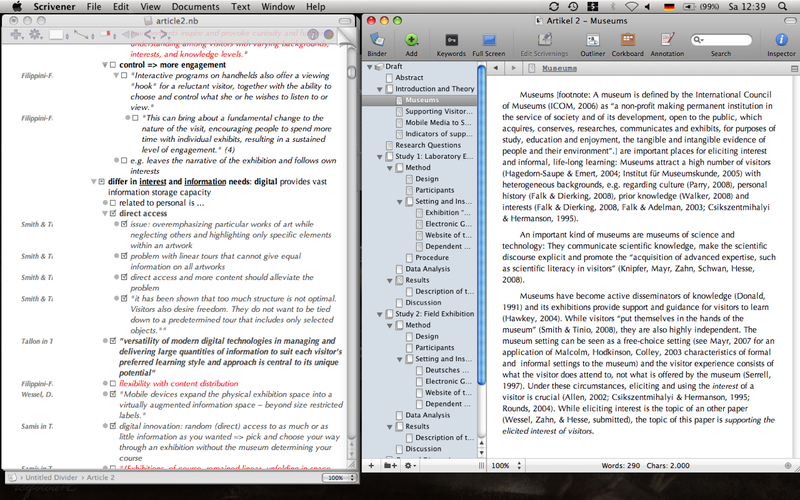 At the time I did organize my work this way (2009) I just dragged the PDFs into CPN. You can set in the settings of CPN whether it should copy them into the CPN oder just link to them. Both has advantages and disadvantages. Over time, I found that it makes the CPNs too unwieldy to use if you copy them into the CPNs. If you link them, probably a simple directory structure with letters of the alphabet would be sufficient. However, nowadays I only keep the reference to the article as keyword and keep all my literature in DEVONthink and the papers/books I have actually read in Papers 2 (a reference manager). The program Citavi will enable you to do what is described here with Circus Ponies along with other fabulous capabilities tailored for the academic. There is a free version of Citavi that hardly differs from the full version. And . 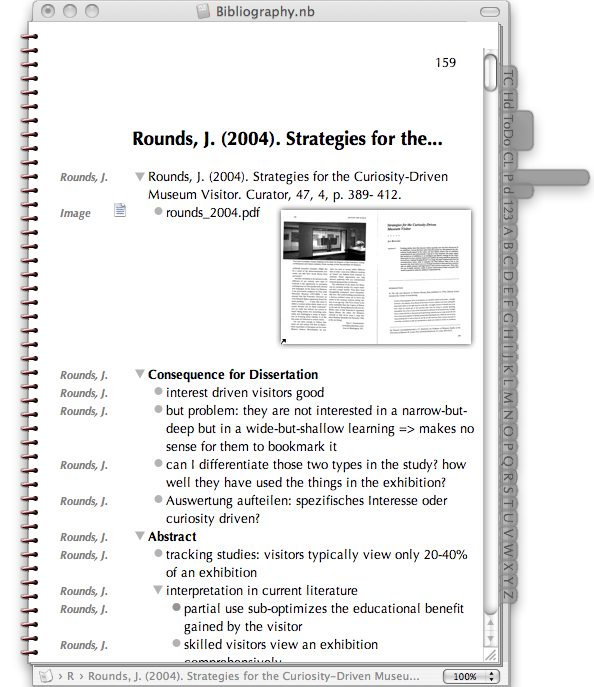 . . Citavi additionally embeds within Microsoft Word so that your Citavi outline, notes, quotes, images, etc. are all juxtaposed right next to your writing area in Word. Double-click on an outline item, note, quote, or image, and it pops into Citavi where your cursor is, taking citation information along with it and dynamically building your reference list at the end of your document. There are TONS of incredibly awesome capabilities in Citavi, and the developers are ever adding users’ feature requests. It’s an academic’s dream.